How to motivate team members who are dispersed around the globe? How to make sure one’s leadership approach reaches people in different cultures? How to contribute to establishing an atmosphere of appreciation for cultural diversity and… trust? These are the questions you might be encountering if you lead a dispersed team. 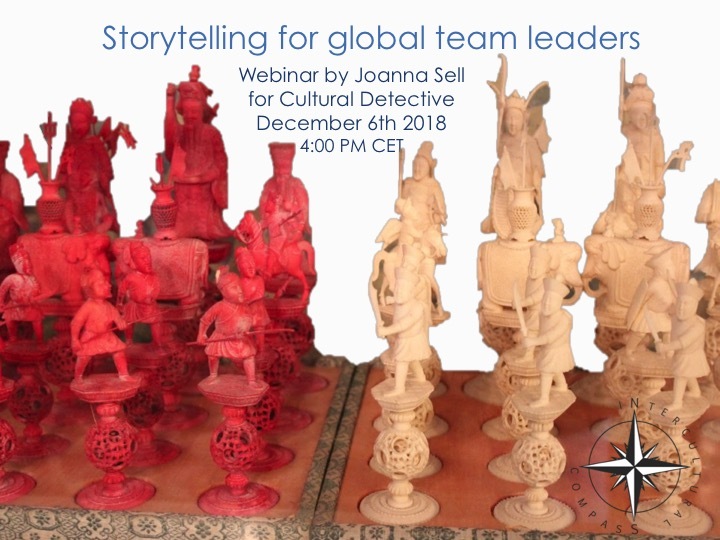 In this webinar Joanna Sell will offer multiple answers and propose the storytelling approach to enhance team effectiveness. After a short presentation on how storytelling affects our brains, including the newest neuroscience research, she will provide three powerful narrative tools that can be used in intercultural programs and by team leaders, to enable team members to work with their own stories and their team stories. The co-creation of stories and story sharing can play a hugely important role in team development and trust. After a short Q&A, series creator Dianne Hofner Saphiere will introduce Cultural Detective Online as a powerful compilation of stories that can be used to reflect on the cultural influences that impact global collaboration, enhance self-reflection and inspire us to work with our own stories of intercultural teamwork.